Parking houses should be an integral part of the city. But how can we challenge the monofunctional use of the conventional parking house? 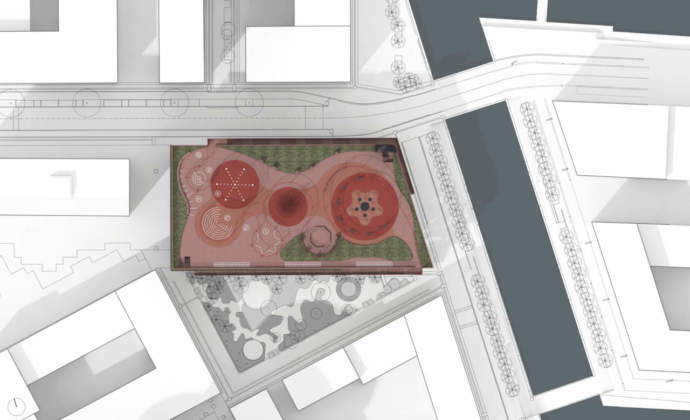 How do we create a functional parking structure, which is also an attractive public space? 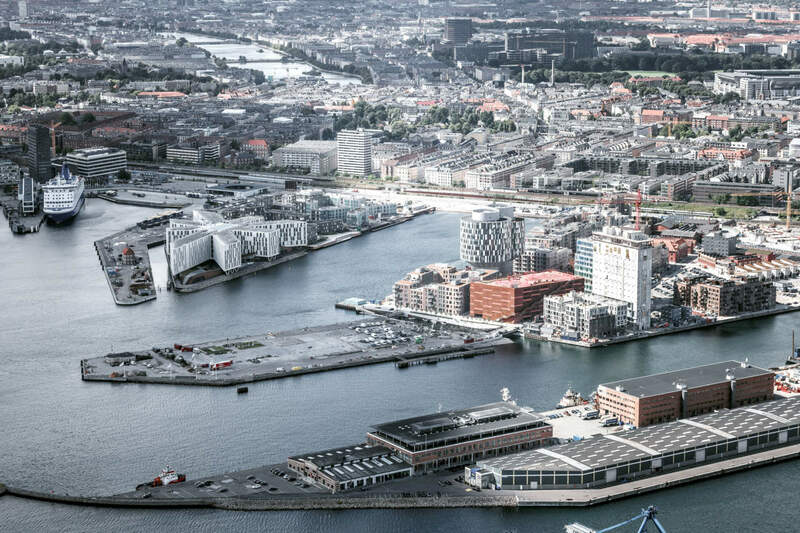 And how do we create a large parking house that respects the scale, history and future urban culture of the new development area Nordhavn in Copenhagen? 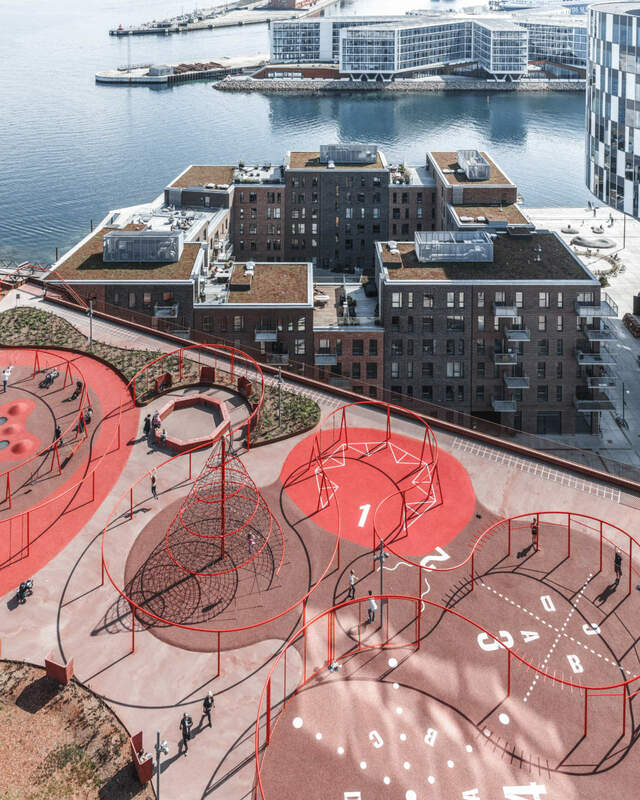 The new parking house is situated in Århusgadekvarteret, which is the first phase of a major development plan for Nordhavn. The neighbourhood is currently under development and will in the future host a mix of new and existing buildings. The starting point for the competition project was a conventional parking house structure. 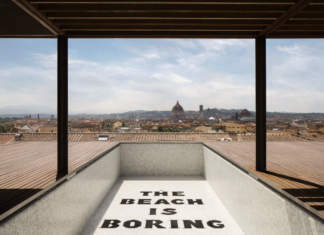 The task was to create an attractive green façade and a concept that would encourage people to use the rooftop. Instead of concealing the parking structure, we proposed a concept that enhances the beauty of the structural grid while breaking up the scale of the massive façade. A system of plant boxes is placed in a rhythm relating to the grid, which introduces a new scale while also distributing the greenery across the entire façade. The grid of plant boxes on the facade is then penetrated by two large public stairs, which have a continuous railing that becomes a fantastic playground on the rooftop. 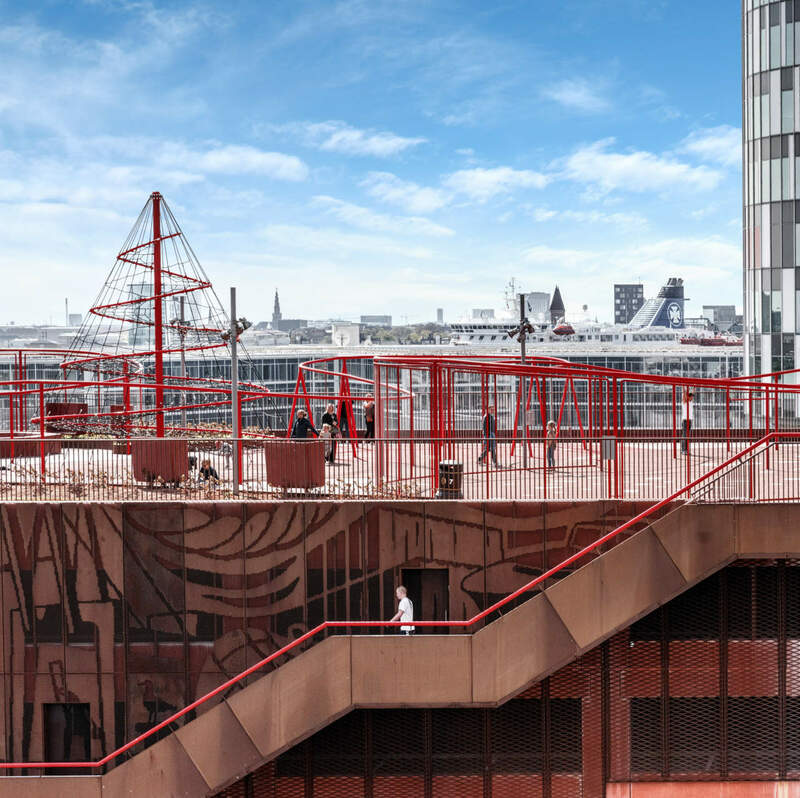 From street level, the railing literally takes the visitors by the hand; invites them on a trip to the rooftop landscape and amazing view of the Copenhagen Harbour. This project is based on a standard, pre-defined concrete structure. The structure has a rational and industrial crudeness, which suits the area’s spirit and history; however, the traditional concrete parking structure can appear cold and hard. As a natural continuation of the area’s red brick identity, we propose a red colouring of the concrete structure. The building will be a large volume in a compact, urban setting, and because of its proximity to the surrounding urban spaces, the parking house will predominately be seen from close-up. To provide scale to the large building, we propose planted façades where a green structure interacts with the building behind. 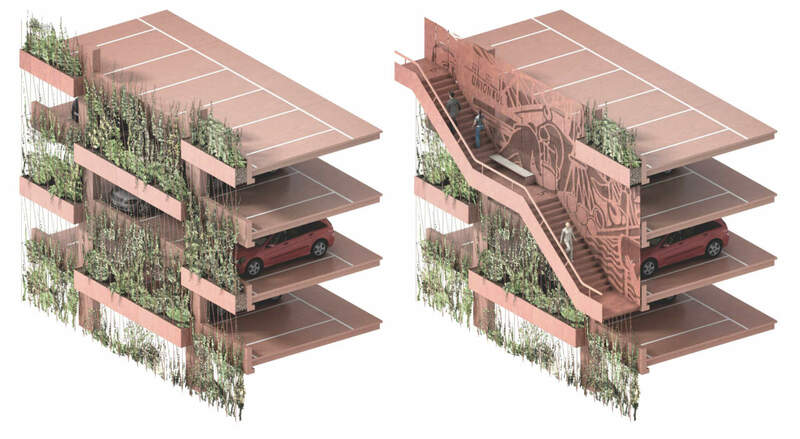 The green façade is made up of a plant “shelving system”, which emphasises the parking structure and interacts with the rhythm of columns behind. The expression of the façades is based on an interaction between structure and nature, the structural vs. the organic, and provides an exciting interdependence between the two. 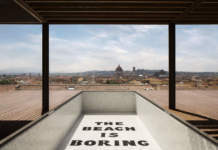 The basic principle of an active parking house is the idea of an accessible and recreational roof offered to local inhabitants and visitors alike. 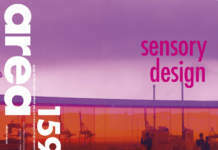 Visibility and accessibility are therefore essential when creating a living roof. 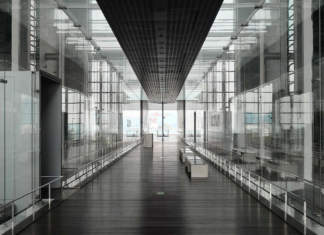 A staircase towards the open square provides a diagonal connection between street- and roof level, and invites people to ascend along the façade. 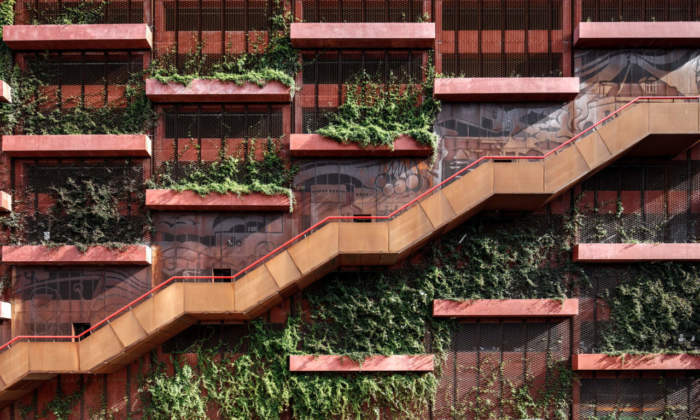 The two flights of stairs on the Northern and Southern façades stand out as vertical passages through the greenery, and clearly mark the connection between street level and the active roof. 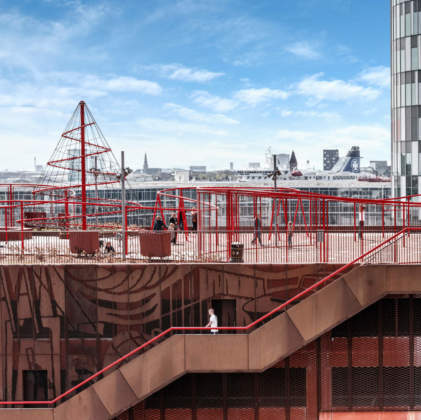 The red thread is a physical guide through the parking structure’s public spaces, which leads the visitor from street level, where the guide is introduced as a handrail on the staircase. 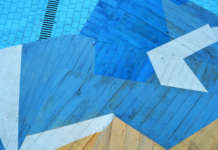 Here, it becomes a sculpture and offers experiences, resting spaces, play areas and spatial diversity. 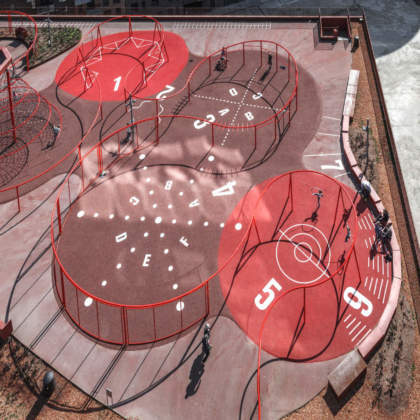 Activities along the red thread are traditional such as swings, climbing sculptures etc., but also more architectural elements such as fencing and plants, which emphasises or establishes spaces while providing shelter from the weather. 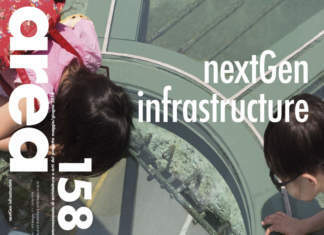 The elevated activity sculpture above the roof provides great flexibility, and makes the exciting activities visible from street level. 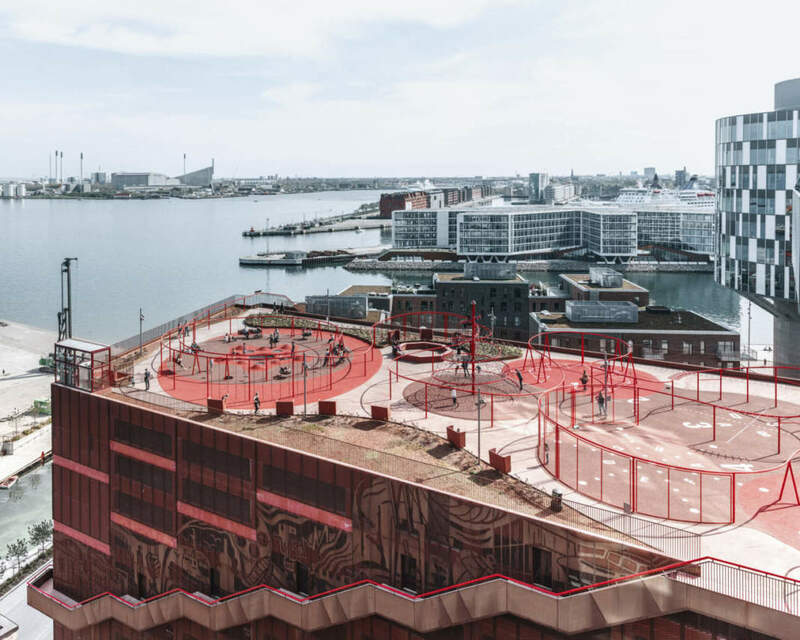 Copenhagen’s new parking house will be a social meeting ground and an active part of its local environment – as an urban bonus for locals, athletes and visitors alike.